I’m holding my breath, but I am hopeful that spring is truly here, aren’t you? Before we get started, I want to share some very important news — especially for all the U.S. flower farmers listening. Every five years the USDA – that’s the US Department of Agriculture – conducts a Census, a complete count of farms and ranches, and the people who operate them, all across the country. 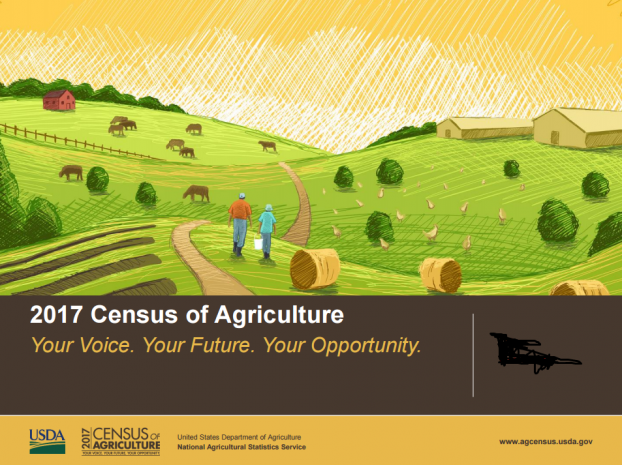 This year, 2017, is an Ag Census year. A lot has happened in flower farming since 2012 and I strongly believe that the Census metrics will reveal that. For instance, we know from the 2007 and 2012 Census reports that U.S. farms representing flowers grew 16% as a crop category. To be specific, that’s a boost from 5,085 farms to 5,903 farms. I am excited to see what the new 2017 Census reveals, but here’s where you come in. The folks at USDA work very hard to get the Census questionnaire to everyone in farming, but as you know, it’s easy for smaller or super busy farms to fall through the cracks. We cannot afford to have that happen, folks. The data reported will influence policy and funding for U.S. Agriculture and I believe that flower farms need to have a much larger piece of that pie, whether it’s through specialty crop block grants, value added producer grants or other programs that help support our industry. Producers who are new to farming or who did not receive a Census of Agriculture in 2012 still have time to sign up to receive the 2017 form by visiting www.agcensus.usda.gov and clicking on the ‘Make Sure You Are Counted’ button through June. USDA defines a farm as any place from which at least $1,000 of agricultural products were produced and sold, or normally would have been sold, during the census year — and that means unless you’re a hobby grower like me, you should be counted! As I mentioned, the sign-up period ends June 30, 2017 — and all you have to do is follow the link and just sign up. By the end of the year, you will receive your questionnaire, which you can leisurely complete in the middle of winter! The new Census will be published in 2019 and of course, I will be here to share the highlights, hopefully with a guest from USDA to interpret it for us. THANKS so much for checking this out. This week, I’m sharing some audio that I recorded on a visit to Alm Hill Gardens. As I say in the title of this episode, Alm Hill is my favorite source for local tulips. 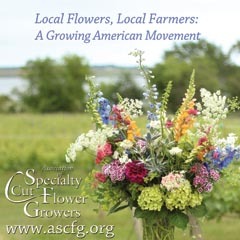 I first met flower farmers Gretchen Hoyt and Ben Craft while working on The 50 Mile Bouquet and there is an interview with Gretchen in that book’s section called “Grower Wisdom,” with photographs by my collaborator David Perry. 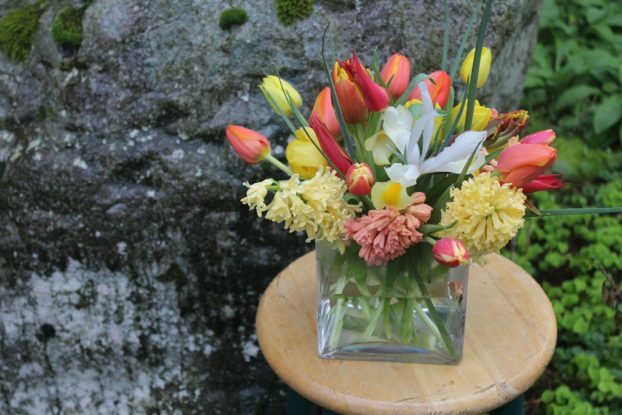 If you have bought tulips at Seattle’s famed Pike Place Market, it’s probable that you purchased the vibrant, fresh and lovely sustainably-grown tulips from Alm Hill Gardens’ stalls. They are my go-to stop for when I need armloads of tulips for a workshop or demonstration. It just makes me so happy to support a local flower farm that brings its harvest direct to consumers. 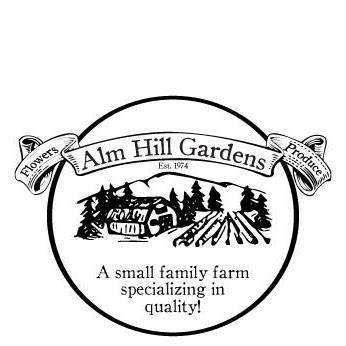 Established in 1974, Alm Hill Gardens is a small family farm specializing in quality. 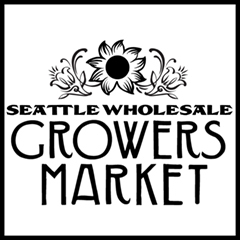 You can also find their flowers in Seattle at the University District Farmers Market, West Seattle Farmers Market and Ballard Farmers Market — all in Seattle. ‘Temple’, a lovely slender tulip. If you follow Gretchen Hoyt and her husband Ben Craft around for a season, you’ll gain a profound admiration for how their values, sustainable farming practices and sheer hard work produce something so ephemeral and delicate as a lilac, tulip, lily, anemone or peony. The couple overcame many obstacles to reach this moment: When they planted their first field of raspberries in rural Everson, Washington, just 2 miles from the Washington-British Columbia border, Gretchen was a single parent of two young children who had escaped from the city. Ben was a veteran of the war in Vietnam who wanted to unplug from society. “Ben’s parents were dairy farmers. I never grew anything until I was 26 years old,” Gretchen says. 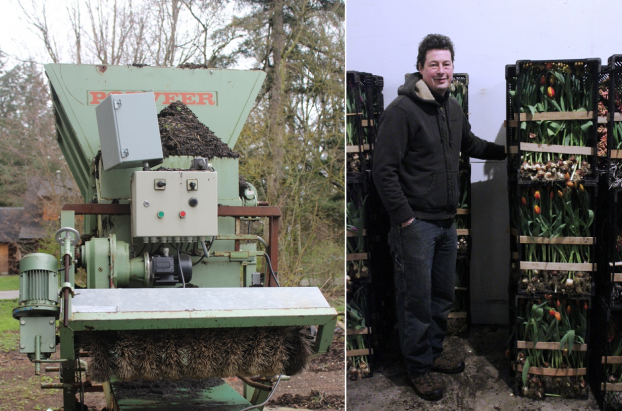 “We had Ben’s dad’s tractor, no running water and no power, so we started with very little at the beginning.” Their efforts grew into one of the first year-round, direct-selling farms in Western Washington. Today, the 47-acre property contains six 30-by-100 foot greenhouses, countless high tunnels (hoop houses that can raise temperatures by 10 degrees), and fields of edible crops and, of course, flowers. Even the spent heads are stunning! 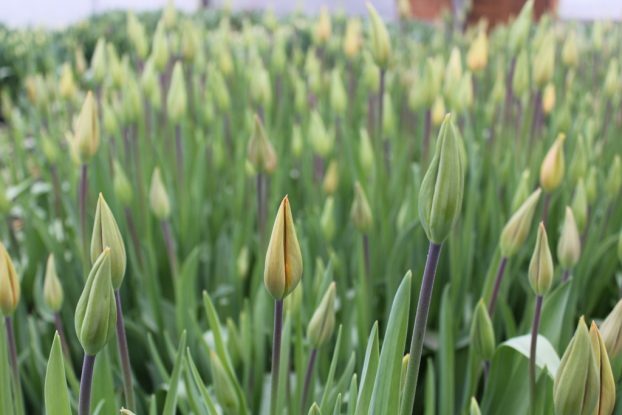 Alm Hill Gardens is known for its luscious cut tulips, which account for 80 percent of their floral production. At Seattle’s Pike Place Market the sign reads: “Alm Hill Gardens: A Small Sustainable Family Farm Since 1974” and the stall overflows with irresistible blooms in a vibrant spectrum of hues to the delight of locals and tourist alike. The longer-than-usual production season — from mid-Thanksgiving to May — is possible, thanks to many growing techniques perfected by the farm. 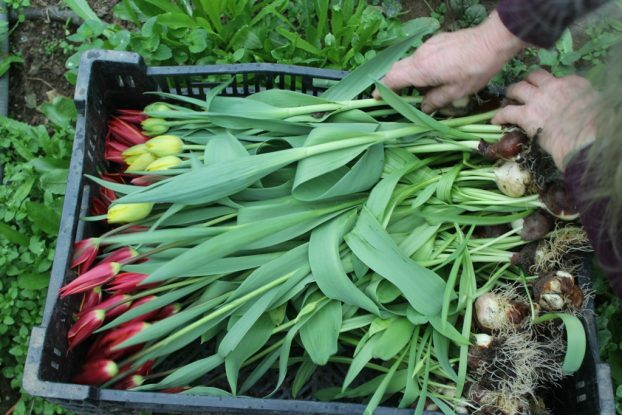 These include planting already-chilled bulbs so they bloom by Christmas. 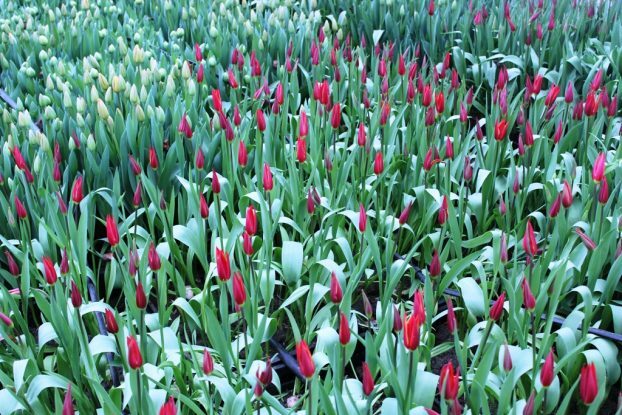 It means sheltering thousands of hybrid tulips in greenhouses that elevate air and soil temperatures and protect stems from Pacific Northwest rainfall. 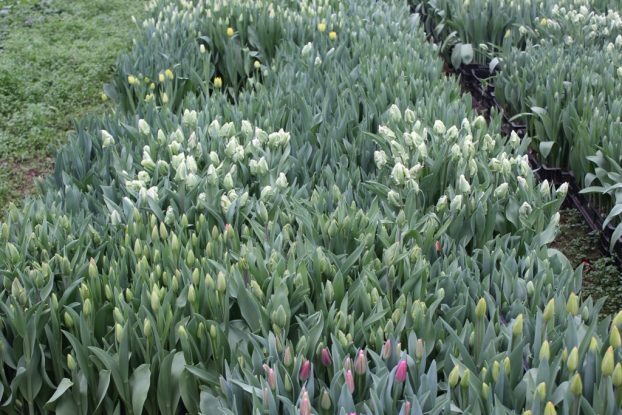 The volume of flowers required to satisfy a bulb-crazed market is mind-boggling, requiring an intensive planting system. Bulbs are planted in 12-inch-high crates and stacked for weeks like building blocks in a large walk-in cooler before being moved to the greenhouses for early spring harvesting. “We have tulip crates stacked floor to ceiling,” Gretchen laughs. 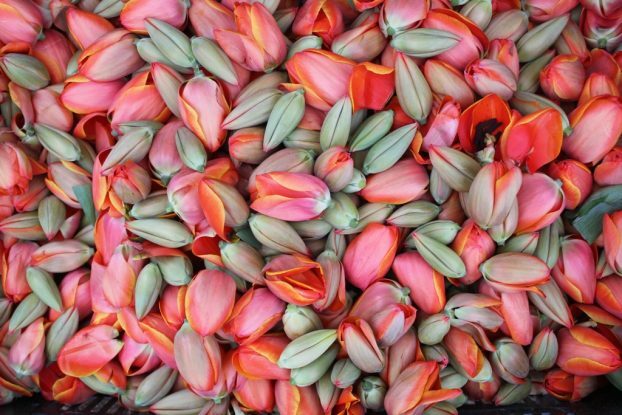 Alm Hill sends an employee with carloads of tulips to Seattle’s Pike Place Market every week and also sells at several neighborhood farmers’ markets including the Bellingham Saturday market, which is closer to home. 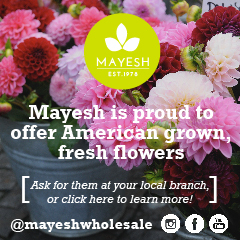 Depending on the season, these brilliant gems on plump green stems can sell from $20 to $30 for a bunch of 30. 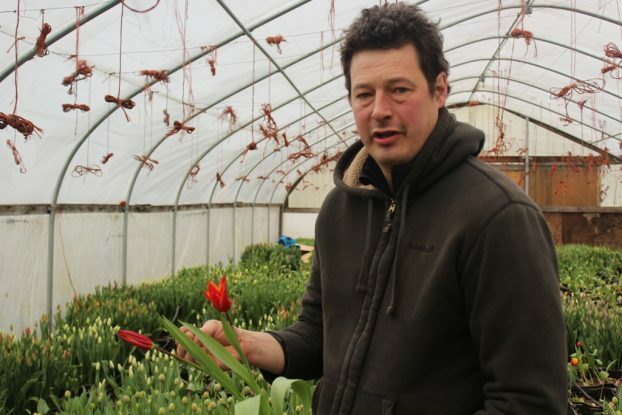 You can find the classic ovoid-shaped tulip, like the orange-and-purple streaked ‘Princess Irene’, or more unusual varieties, such as the parrot and French tulips. 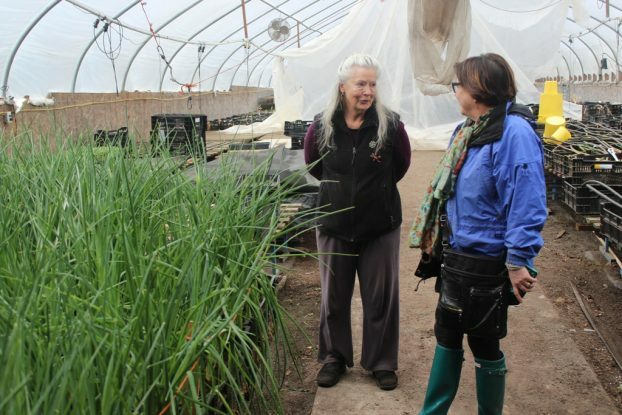 Gretchen Hoyt of Alm Hill Gardens (left) a veteran flower farmer. Lorene Edwards Forkner, editor of Pacific Horticulture magazine, right. Joshua Craft led us through the high tunnels. You will hear several voices on this episode, Gretchen Hoyt, her son-in-law and farming partner Joshua Craft, an experienced vegetable, grain and livestock farmer who is now deeply involved in Alm Hill Gardens, and of course, me. The fourth voice is my dear friend Lorene Edwards Forkner, editor of Pacific Horticulture, a fabulous quarterly journal that covers people and plants on the West Coast. Our day trip to Everson was so special. 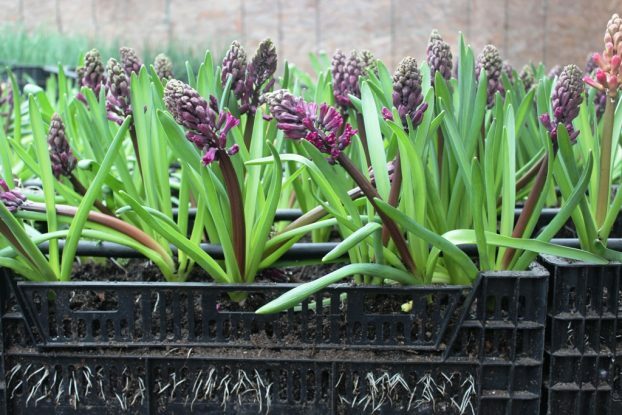 Super healthy, fragrant hyacinths grown in crates. Lorene designed this on the spot to showcase irises, hyacinths and tulips, just-picked from Alm Hill Gardens. 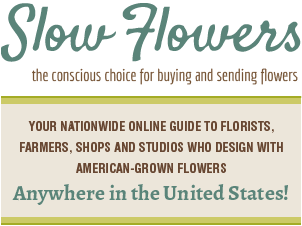 The Slow Flowers Podcast has been downloaded more than 180,000 times by listeners like you. THANK YOU to each one of you for downloading, listening, commenting and sharing. It means so much. Thank you to family of sponsors! I’m so excited to announce that Syndicate Sales has returned as a 2017 Slow Flowers sponsor! 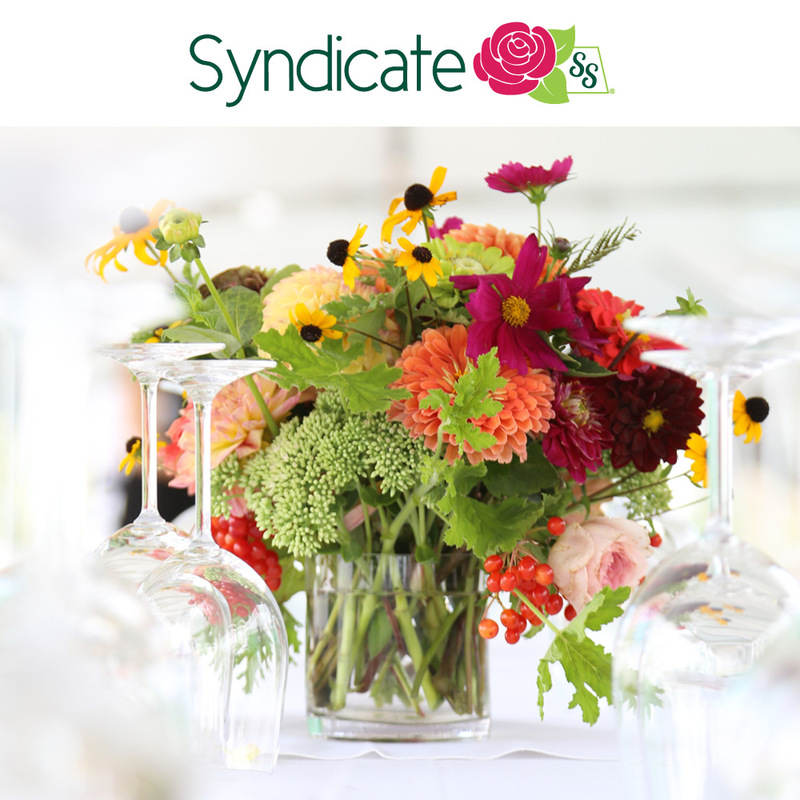 Syndicate Sales is an American manufacturer of vases and accessories for the professional florist. Look for the American Flag Icon to find Syndicate’s USA-made products and join the Syndicate Stars loyalty program at syndicatesales.com. 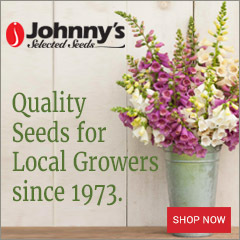 And drumroll, please, let’s welcome Johnny’s Selected Seeds as our newest sponsor. I can’t tell you how jazzed I am to partner with this employee-owned company that brings the best flower, herb and vegetable seeds — and supplies to farms large and small. Check them out at johnnysseeds.com. 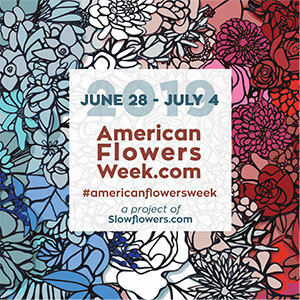 This entry was posted on Wednesday, April 19th, 2017 at 5:13 am	and is filed under American Grown, Blog Posts, Flower Farming, General, Plants, Podcast Episodes, SLOW FLOWERS Podcast, Slowflowers.com the Directory of American Flowers. You can follow any responses to this entry through the RSS 2.0 feed. You can leave a response, or trackback from your own site.